You are the cover story! The first time I ever kept a journal, or was even introduced to the concept of journaling was an eighth grade English class. At the beginning of each class, we had five minutes of free writing time. We could decorate our creation with pictures or stickers or whatever was representative of us at the time. I still have it, and I have gone back and read it from time to time, and it’s like unraveling a mystery of how I became who I am. They were never graded, never checked for grammar or spelling, just writing what was on our minds, so I wrote the way I talked, and it’s the closest I’ve ever come to traveling back in time and talking to my former self. Oh, the things I wish I could tell my thirteen-year-old self. DCT has crafted a season that takes us on a journey together, and just like any journey, it’s full of anticipation, time spent with loved ones, and epic performances that will live in the collective memory of your family forever. This year-long journey will be full of music, dancing, miracles, puppet magic and life lessons that will leave you and your family with so many invigorating conversations and lifelong memories. We really want you to journal about your experience. We would love for you to share them with us, but you don’t have to. Our hope is that something you experience this season, whether it’s the tricky balancing act of being happy for our friends like Fancy Nancy or learning to think outside of ourselves and really love those around us like Edward Tulane, will be intertwined into the mystery that makes you who you are. Years later when you read about your experience with a frog, toad, or big friendly giant, your own personal mystery will unravel a little more. The journey is even more fun the second time around. 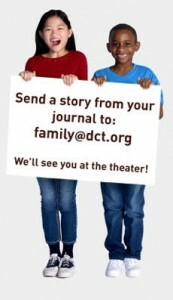 So, as you take this journey with us, create a journal, individual or together as a family about your experience at DCT. Use adjectives to describe your experience – we love adjectives! If you do share even one journal entry with us, DCT will provide tickets to a family that wouldn’t otherwise be able to come together as a family for a live theater experience. Just think, you might land in their journal for making such a generous contribution to the story of their life. For those wanting to share these stories just send them to family@dct.org. We’ll see you at the theater, and we can’t wait to read about some of your adventures!